This Monday, Apple will be holding a media event at the Yerba Buena Center for the Arts Theater in San Francisco. The topic of conversation is expected to be the Apple Watch. Hopefully, Apple will fill in some of the missing blanks such as pricing for the mid-range and high-end variants of the timepiece, the actual launch date for the device, how water resistant it is, and the how long the battery lasts between charges. That last question has troubled many a potential Apple Watch buyer. Apple has said that the timepiece would need to be charged every night. Those who have tested the Watch say that its battery life has been improved. While the original target was for the device to run for 2.5 to 4 hours with heavy app usage, the wearable can now last 5 hours with such use. And while Apple's goal was to get 19 hours of life for light app use, notifications and glances combined, the watch can now run over 24 hours with that kind of use. The New York Times recently revealed that Apple Watch users can activate a "Power Reserve Mode" on the timepiece, which conserves battery life on the device. 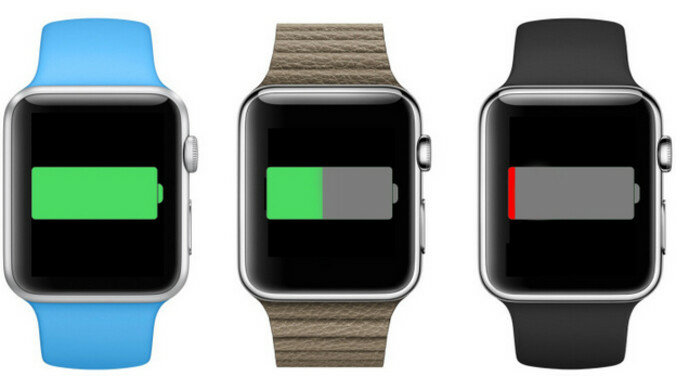 The "Power Reserve Mode" can be turned on at all times, even when the battery is 100% charged. It dims the screen, communicates with a paired iPhone only on-demand, and after two-seconds of inactivity the Watch goes to sleep. Apple has also allegedly improved the speed at which the battery on the Apple Watch recharges from 0% to 100%. Using the MagSafe charger, this task now takes four to five hours. To alert the user that his Apple Watch battery is low, with 20% remaining, the Battery Life glance turns orange. With 10% left, the Battery Life glance turns from orange to red. And speaking of battery life, those who have tested the Apple Watch say that when paired with an iPhone, the Apple Watch will not impact the battery life of the handset in any "meaningful" way. I thought improvement was by "10 seconds". lol apparently 10 seconds is a pipe dream now. They now shut off the screen after 2 seconds of inactivity....so you can't even read a message properly without having to hit the screen again. And without that mode I assume it will have very crappy battery life because they say 24 hours, but what it probably is is more like 12 hours (manufacturer listing/2 rule). Plus you can't trust "those who have tested the watch", a group cherry picked by Apple which may as well include Santa Claus for all we know. Sadly, I think they made fun of other watches for not having the battery life and how they wanted to make it when "the tech was ready". So if it is ready why is it just as bad if not worse than the competition? A mac book Air got 12 hours and that was rather conservative, like most of the theings Apple discloses. The rumored "power saving mode" makes a regular watch from Apple watch - raise your wrist the display will show you the time for 2 seconds and then it will swith off aggain. Understand ? But think about using it, lets say you are reading a message that is 3 or 4 lines long, which should fit in the screen. It will take about 2 seconds to read after which the screen goes off. If you want to reply or didn't finish reading then you have to activate it again. Checking time is all good, but then why did you get a "smartwatch" if that is all you wanted to check? Wow, exactly what my 360 does and I imagine the other AW devices do as well. So that's Apple's power saving mode. 2 days away Jedi... Hey, you're married now right?? Did you end up marrying your left hand? Or the right one? Please, maherk, let's be civil about this and not resort to such tactics. That is his personal life and has nothing to do with our differences in opinion about things on this website. Yeah, it's so personal that they have to discuss it on public forum. We just know each other here, nowhere else...not our fault. You got a problem...don't read, move along. Does your mom still do your laundry? Whoaa...i missed a year with you then...haha. Last when i commented on your line was before you got married. Cheers...hope i'm not too late. Yep, things are going good. Major adjustment lol. The single life is something else. How've you been? I slowed down a little too. Still a few cool guys here though. 4-5 hours and 24 hours? Lol. My moto 360 charges in an hour and lasts 40 hours easily. good for you , now lets wait for real reviews of the Apple watch. BTW I like the moto 360 myself ,cool watch. any cool apps you use everyday that make it useful ? Sadly the 24 hour "super saver mode" is Apple's provided estimate. The manufacturer always exaggerate the reality by a magnitude of 2 usually. Now that's what I'm talking about. I was looking at either the wireless garage door or wireless deadbolt and a front door cam for deliveries when we're gone, but you've certainly taken it to another level. Need to expand my project a bit. That's a pretty sweet hookup. My guess is with Homekit and Siri, Apple surely will make it possible for the Apple watch to control home automation. Which I believe is a cool feature to have in a smart-watch. I'm also looking for something that allows me to do remote start and keyless entry for my vehicles as well. Have you heard of any third party apps that allow for that? Yeah there are a lot of aftermarket remote start/keyless entry systems that offer that, but I'm looking for an app that will interface with the factory system. So far everything I've found is on a subscription basis, anywhere from $50-$300 a year. Oh well, maybe something will come in the future. Really all it should be is transmitting the same signal that the key fobs do, but it's probably proprietary.